As we made our way back south down the Milford Road we made a stop for a longer trek up to Key Summit, so named because three rivers flow south, east and west to three different seas from the peak. Fabulous views and alpine bogs at the top. We stopped for lunch as we passed through Te Anau again and then made for Gore – not for any specific reason but just because it happened to be there. There were no DOC sites but we did manage to find a municipal campsite about 10 km out of town in Dolomore Park. It was one of the best places we stayed – for NZ$6pp we had a kitchen and a HOT shower and a lovely soft almost untouched lawn to make camp in, plus there were only one other set of campers. There was a huge playground to one side and a little trek in the evening lead us to a river with hundreds of glowworms on display. We were however woken up by the sound of many children. I poked my head out of the tent to see that the campsite had turned into a car park and the park had been invaded by about 50 five year olds about to go on a nature walk. As one little fella walked by he asked his friend “why are those people camping in the playground?” I didn't have an answer for him but 2 people hurriedly taking down a tent did provide the kids with lots of entertainment. We had a little walk in the woods, up beyond the glowworms after breakfast and left the kids to their climbing frames and swings. Dunedin is New Zealand's Scottish city and it seemed like a sensible enough place to celebrate St Patrick's day. We checked into a super modern hostel with absolutely no atmosphere (On Top) and went out to see what was going on. Before too long we found an Irish bar and joined the local student throng listening to the diddli-idle band. It was all very plastic paddy but that's what was on order so we joined in with gusto. Bleary eyed, we left Dunedin the following afternoon and made our way up the coast to Omaru. A pit stop on the way was the unusual Moeraki boulders. They are perfectly spherical large boulders laying in the sea having been created over time in the nearby cliff and falling out as it erodes. They are quite otherworldly and make some interesting arty photo opportunities. Back in the car and a few hours later we hit Omaru, a small town with lots of restored turn of the century buildings, one of which contained our hostel, the Empire. It was a very welcoming place and friendly place and although we didn't see any, had penguins in the car park. We had a very lazy evening, watching the second installment of the Lord of the Rings. We packed up and made for Christchurch, our final destination in New Zealand. Jailhouse, a hostel in a former prison, still in operation in the 90s, was our accommodation for the first night. It was well done with very authentic cells for rooms, plus they left a few cells as they had been, complete with graffiti. An incredible luxury was a TV and DVD in the room which we used to complete the Tolkien trilogy. So it came to pass that I woke up in a prison cell on my thirty first birthday. I did however have an uncomfortable realisation that my camera was nowhere to be found as we packed up for the last time in New Zealand. Working back to when I had it last ... I determined that it had fallen out of my pocket unnoticed as we came back to the car from the Moeraki boulders. That is the reason why there very few photos of the South Island in the galleries. I was livid with myself but nothing could be done after calling the police, local restaurants and the Omaru hostel proved futile. A new record for me – this camera had only lasted about 2 months. We checked into a more centrally located hostel and dumped our large collection of equipment in a storage room before arranging to drop the car off at the airport. Despite its age and high mileage it hadn't given many problems. we did make a quick stop-off in a suburban shopping centre to pick up a South East Asia guide and reluctantly to replace my camera. A new model had been brought out – so I think I have had every incarnation of the Olympus waterproof range bar one at this stage. Grrrr. Still, they managed to sort it out to charge by USB now so that would mean a few grammes of baggage less. As we were at the airport we stopped into the Qantas desk and rearranged the flights, brining forward the trip to Bangkok by a week and arranging dates for the India and dare I say it homecoming legs of the trip. Christchurch is used as a base for Antarctic missions by a number of countries including the US and an Antarctic centre has grown up. In order to capitalise on the tourist dollar an Antarctic experience has also been constructed, winning Christchurch's “best tourist attraction” twice. It had a cold room which allows you to experience -18°C for a few minutes – good fun in a pair of shorts and a t-shirt! It also has a collection of disabled little blue penguins which have been rescued from various accidents – some have gammy legs, others are blind or only have half a flipper. Feeding time seems to be the only exercise they get as they are an inherently lazy species, content to do nothing. There's an opportunity to put on some cold weather gear and pose for photos and see what the bases are like. The best part of the day was a drive around an assualt course in a Haaglund, a Swedish specially designed amphibious polar vehicle. Don't get me wrong it was good, just not great. The hostel, Coachman was a very friendly place and the management were very amenable to the fact that we had way more stuff than we should have as backpackers. We were planning to sell or give away what we could and as I was photocopying the flyer I had made, made the discovery that everyone else was doing exactly the same thing. All the noticeboards were full with pots, pans, tents and campervans for sale. Thank god we had rented and not bought a car! Claire had started getting a cold a few days back and it really kicked in here so she spent a lot of time sleeping while I read up on SE Asia and generally chilled out. Then the big one came – very early on a Sunday morning I went down to a jam packed English pub to watch the final game of the six nations. 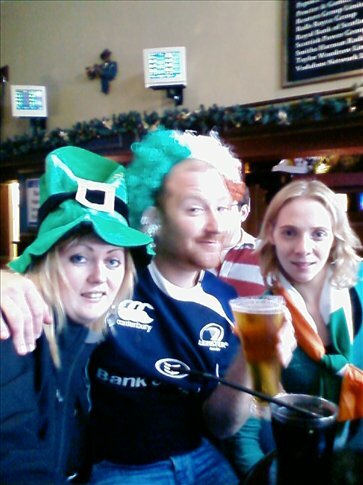 There was a majority of Irish but a smattering of loud Welsh with which to banter. It was the most tense game I can ever remember and the relief and joy at the final whistle was tangible. The place erupted and spilled out on to the early morning street. Myself and the fellow supporters I had made friends with were in no mood to go home or back to bed so we made for an Irish bar someone thought was open. It was and I don't think a bar maid was ever as surprised to see thirty people dressed in green looking for pints of Guinness before 9 on a Sunday morning. She hadn't even put money in the till. The morning carried on in celebration before we moved on to another place, where one of the lads worked. I suspect this was the only reason they let us sing rebel songs for hours on end before the time came to pour ourselves into buses and taxis and go to bed. It was fabulous to be able to celebrate it in such style but for the first time on the trip I did miss being at home on the occasion of the first 'slam since 1948. The flight to Bangkok was fast approaching and my ad hadn't brought as many enquiries as I had hoped. One English chap took the gas stove of me for $10. We started to pack up bits and pieces to send home or throw out – my yellow hoody bought in Uyuni would no longer be needed. On the last day I managed to give a lovely English couple most of our gear for $40. A great deal for them. The second hand bookshops wouldn't touch The Lord of the Rings or the NZ rough guide at all so we left them in the hostel along with the hoody and our blankets. Hopefully someone will get some use out of them. With the package sent home all that remained to do was do the final pack for SE Asia. I had managed to clear out a lot so my pack was quite a lot lighter as we walked into the Cathedral Square for the last time. Christchurch is pretty, reminding of Oxford or Cambridge but we didn't really do it justice at all. You can't win 'em all. Next stop Asia!